Super-Earths are exciting finds. The more of them we discover, the more likely it seems that life is abundant in the cosmos. But new work examining the viscosity and melting temperature of mantle rock is casting a different aura over super-Earths. Rather than being planets much like the Earth but simply more massive — worlds characterized by thick atmospheres, plate tectonics, volcanic activity and magnetic fields — they may differ in fundamental ways. With internal pressures tens of times higher than those found in Earth’s interior, large viscosities and melting temperatures could have adverse consequences on the planet’s habitability. Without a liquid metallic core, a magnetic field that could play a role in protecting the atmosphere from solar particles would be unlikely. Moreover, plate tectonics are not inevitable on a super-Earth, a phenomenon that, along with volcanic activity, can play a role in regulating the climate during ice ages. Stamenkovic and team are looking at the effect of volcanic outgassing and the production of molten rock, which they believe decline with increasing planetary mass. “Our work highlights the importance of understanding the thermal evolution of planets — moreover, it shows that super-Earths are more diverse than expected. We will only be able to fully answer questions by gathering more data from high-pressure experiments and from spectroscopic observations of super-Earth atmospheres orbiting close-by bright stars. Theory shows the possibilities, which are far larger than previously thought, but remains full of uncertainties,” said Stamenkovic. Image: A super-Earth like the one in this artist’s conception can grow twice as large as Earth with up to 10 times the mass. But would its thermal evolution make it a likely candidate for life? Credit: David A. Aguilar (Harvard-Smithsonian/CfA). Even in a differentiated super-Earth, the researchers found that heat flow from the core can be limited by stagnant layers forming deep in the mantle, with conduction instead of convection becoming the primary form of heat transport, which would reduce the cooling rate of the core. 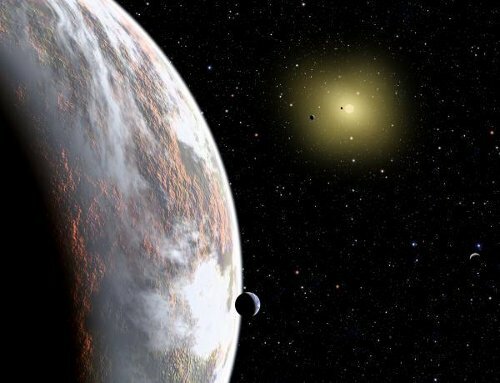 We lack the data to make the call, but easy assumptions about super-Earths and habitability now have to contend with robust alternative scenarios. Two papers coming out of this work are available: Stamenkovic, et al., “The influence of pressure-dependent viscosity on the thermal evolution of super-Earths,” Astrophysical Journal, 748:41 (20 March 2012) and Stamenkovic et al., “Thermal and transport properties of mantle rock at high pressure: Applications to super-Earths,” Icarus 216 (2011), 572-596. More in this European Planetary Science Congress news release. Do they know the density of any of these super-Earths? A lack of a magnetic field would have no major impact on a super-Earth in its star’s HZ. The planet will have more than enough mass to have a death grip on most common atmospheric gases. If the planet’s primary is an M dwarf with flares, a flare could heat up its outer atmosphere. A magnetic field would provide protection, but mainly from the charged particles – the other effects of a flare (x-rays through IR) would be more worrisome. I don’t understand how anyone can say that a super Earth will not have a magnetic field when we can’t say with certainty why Venus and Mars don’t have one, but Mercury does. Seems if we aren’t sure in our own backyard, speculation about exoplanet super Earths is just a guess. “The more of them we discover, the more likely it seems that life is abundant in the cosmos” — I suggest we reserve judgement until we can get a closer look at them. We haven’t yet even turned up a single extraterrestrial microbe, living or dead, in our own Solar System! The abundance of life in the Galaxy could still be anywhere between almost everywhere and almost nowhere. Daniel, Venus has no field because of it’s extremely slow rotation (this would weaken the dynamo effect) and Mars hasn’t any because it’s smaller and therefore has cooled more than the other planets to the point that it’s core can’t sustain a proper field (and there is plenty of evidence that it once had a pretty global one in the past, lending strength to the importance of thermal evolution). I’ll admit that Mercury is pretty interesting in terms of a strong field generator but it is no where near the required strength to sustain life like on Earth. Other models focus on assistance from salty sea currents and what not but you can be certain that it’s a certain balance of factors pertaining to conditions and compositions in the core. Unless the cores of super earths are rich in conducive metals (like iron) or they are of the right size to allow proper differentiation according to these research papers, we shouldn’t put our money too soon on them as far as life as we know is concerned. A satelite(s) should have an effect via tidal heat. If the planet is undifferentiated the effect should be increased if I understand the process correctly. Now what are the chances of super-earths having a large moon? If the actual density of these planets cannot be measured, how do we even know if they are terrestrial planets at all? Maybe they are smaller versions of Neptune or something with a density between that of a terrestrial planet and a Neptune. They might be waterworlds, with 2000 kilometer deep oceans. A pet peeve of mine. I don’t know where this meme started or why it still sticks around. The only papers I’ve found on the subject are almost all related to Mars and Mars is a special case. Mars != all habitable planets. but it is no where near the required strength to sustain life like on Earth. I am afraid I agree with torque_xtr and FrankH on this one. Why is a field required for life? On a super Earth, it cannot be atmosphere, because that will be held easily gravitationally. It cannot be radiation, because that is taken care of by the (likely thick) atmosphere. So what, then do we need this field for, exactly? In general, exoplanets are at the frontier of our knowledge, and there are major gaps to be filled in. It seems sensible that super-earths will differ in significant and unexpected ways, but it’s too early to predict the habitability of planets we’ve barely studied. We can only make conjectures at best. Current theories state that Venus and Mars became inhabitable due to solar wind ablation. However, a super-earth with higher gravity would have a stronger grip on its atmosphere, making it unlikely that solar wind would strip it off. Also, it’s plausible that life on such a place would adapt to increased radiation and/or periodic flaring. Life on Earth has adapted in innumerable and ingenious ways, so I’m sure evolution on other planets would have similar flexibility and fitness. I don’t understand what’s being said here. As is well known, our homeworld Zarig has a mass of about 25 sextillion tons, which ensures that our crust is stable and avoids the crustal fracturing and motion which afflicts smaller zarigoid worlds over long periods of time, and would in theory prevent the formation of the great shield volcanoes (because the tectonic plates would move relative to them) which build the atmosphere which helps warm our world and is constantly abraded by the wind from our daystar Shara. Why, on such unfortunate planets, the scraping against or even subduction of these plates would cause the very crust to shake: how would a crystal forest ever get to grow? … and we well know the importance of the crystal forests in our ecosystem, only they are able to reach down through the ocean layer to bring up metals from the ocean floor up into the nitrogen-oxygen-carbon dioxide layer which higher life breathes! Such small planets — say of around 6-7 sextillion tons, like little lifeless Zag, the next world in from us around Shara — would have trouble retaining air and water when their suns flared, which happens quite frequently. A habitable planet, such as Zarig, has a surface atmospheric pressure of 100 or more pounds per square inch, which is what makes it possible to have a layer of air-crystal-plants which screens the surface from deadly solar radiation, while collecting the useful energy and transmitting down to the surface through the airplants’ root systems. Indeed, crystallife might never evolve. Computer models demonstrate that on a smaller zarigoid world, most of the vital heavy metals, including the radioactives, would almost completely settle to the core. Life’s own evolution would be slowed by the relative dearth of uranium and thorium, to name the two most common actinides, in the crust. And would intelligent life evolve at all? We gained our intelligence by the intellectual complexity required by our triphibious lives: walking, climbing, spreading our wings to fly, and swimming through the oceans. On a smaller zarigoid world, would the air even be thick enough for large animals to fly? Would there be enough water to cover the entire planet? All the smaller zarigoid planets in our own system either have no oceans or pathetic little oceans that are at most a few miles deep, from which the naked crust protrudes into the barren skies. And how would this hypothetic race ever attain space travel? On Zarig it was easy to float our airports higher and higher in the sky, until eventually we managed to build ones high enough above the atmosphere for our atomic rockets to easily attain orbit? Would life on a subZarigoid world even have enough radioactives to build atomic rockets? The weak forces of chemistry are of course inadequate to attain orbital spaceflight. No, it is clear that the subZarigoid worlds now appearing in our space telescopes are either lifeless, or their life non-sapient, or forever bound to their planetary surfaces. Let us shed tears of pity from all six of our eyes, and waggle our tentacles in relief that we were born on the one and only planet in the Universe uniquely crafted by the Creator for the evolution of life, sweet benign Zarig! Some super-Earths have had their density measured, almost all of them Kepler discoveries. See http://kepler.nasa.gov/Mission/discoveries/ for an overview of known densities of Kepler planets, several of them super-Earths. E.g. Kepler-10b with 4.6 Earth masses and a density of 8.8 g/ccm (larger than Earth’s) will certainly be a terrestrial planet, but this seems to be the exception rather than the rule due to 10b’s surface temperature of 1800 K – even Neptune might lose all its volatiles and become “terrestrial” there. The super-Earths which have temperatures even remotely comfortable (<800 K, say) all (like Kepler-11d, e and f) seem to have densities < 1g/ccm and thus are probably "gas dwarfs" rather then terrestrial planets (they're not even dense enough to be waterworlds). So any habitable-zone terrestrial planet should presumably weigh less than Kepler-11f's 2.3 Earth masses, which excludes almost all known super-Earths. Boy, to come to their conclusion the authors of that paper must have worked with a lot of factors that are unknowns to me. The one that seems to be the least of a liberty is the thermal conductance of rock, and how much heat it would retain during core formation. Actually I only even think of this because we have previously discussed evidence for Mercury having a liquid core on Centauri Dreams and, if true, would not fit with a model of a large metal core, and mantel of anything like what is assumed to be typical conductance. This problem is exasperated by different C:O ratio’s in the protoplanetary disk having potentially dramatic effect on the rock type and composition. What is a typical inventory of radionuclides during planet formation? Is this now known sufficiently well to rule out it melting cores that form rapidly after an infusion of material from a nearby supernova. Our system seemed to have been dramatically effected this way, but how typical are we? As the size of a terrestrial planet increases, the gravitational potential per mass becomes very large. In fact so large that in a core anywhere near Earth’s size the energy released from differentiating this body is itself much more than energy required to melt it. Thus if any sufficiently thick inner layer melts, it is hard to see how it wouldn’t all liquefy. Lastly, as everyone else seems to have covered, why does a superearth need a magnetic field for life? Holger, there would be a significant selection factor in favour of worlds with larger discs that more easily reach the threshold of detection by Kepler. very interesting and relevant information, because this implies, simply put that any terrestrial planet in the HZ must have a mass not more than about 2 -3 Me, in order to be earthlike. Any bigger and it will retain a very dense atmosphere of lighter volatiles. Remarkably this was already mentioned by Stephen Dole in his classical “Habitable planets for man” around 1964. If I remember well, he put the upper mass limit somewhere around 3 – 3.5 Me. Jordan: Fantastic :) Oh I just loved it !!! Any bigger and it will retain a very dense atmosphere of lighter volatiles. Making it more like a small Neptune than Earth-like, or at least a waterworld with a 1000 kilometer deep ocean. yes, but planets much smaller than the Kepler-11 planets (down to 0.57 Earth radii) have already been found by Kepler (in fact, the majority of confirmed Kepler planets is now smaller than Kepler-11e, and several of those are more temperate as well) , so such smaller but denser super-Earths could easily have been found as well. In fact, there is also a bias in favour of higher mass among those Kepler discoveries with measured density, since the mass (and thus density) of more massive planets is easier to measure, whether by radial velocity or by transit timing in multi-planet systems. In total, I don’t see a real bias towards less dense planets in the Kepler results. So we should consider the Kepler-11 planets as “typical” super-Earths within their temperature range IMO, until we get a larger sample.